“I came to the Operations Academy with no real idea of what I would learn; actually I thought I was well versed with regard to what I do in managing traffic. Two weeks later I leave with a fresh view and it has changed my world view after 25 years of experience.” David L. Allen, Captain, North Carolina State Highway Patrol. “TSM&O will be my priority in managing our operations center from traffic incident management to traffic operations.” T.J. Bathras, Jr., TMC Manager, Baltimore City Department of Transportation. 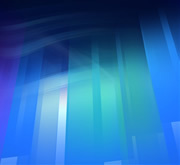 “Outstanding program, excellent networking opportunity. This program has provided me with the skills to move our TSM&O program to the next level.” Bonnie Castillo, Emergency Transportation Operations Manager, Iowa Department of Transportation. “Great networking opportunity. The relationship built in the Academy will grow in the future helping us for knowledge and best practice resources.” Dong Chen, District ITS Program Manager, Florida Department of Transportation, District 4. “The Operations Academy was an excellent experience and greatly added to the knowledge and expertise I need to grow as a competent traffic operations manager. This was a great introduction to the transportation system management and operations concept and the curriculum design, team workshops, and field visits were exceptional. The diversity in the course participants added to my understanding of other roles within TSM&O and their significance. I plan to investigate and assess where we are at – GDOT – with our TSM&O practices. I would like to champion operational performance measures and TSM&O in the planning process.” Paul DeNard, State Traffic Operations Manager, Georgia Department of Transportation. “Although we do not struggle greatly with congestion issues statewide I see this as an opportunity to be proactive rather than reactive as traffic volumes increase in the future. Also can make practical suggestions to the few areas in our state that we do have congestion areas. This also gave me an insight as to how we should/could use the limited data we are already collecting to educate/inform the public.” Tammy J. Ellis, District Transportation Administrator, Vermont Agency of Transportation. “Smarter use of our existing transportation system is the only answer for the future. If you would like to help lead your organization to effective systems operations and management, then the Operations Academy is for you.” Aaron Johnson, Traffic and Safety Engineer, Michigan Department of Transportation. “Relentless total immersion program in TSM&O will facilitate being a supporter of TSM&O in my state DOT. Great camaraderie developed on a daily basis.” Mark Kirouac, Assistant State Maintenance Engineer, New Hampshire Department of Transportation. “I learned so much from both the presenters and the classmates; more than I expected. The intense immersion in the TSM&O topics will leave a lasting inspiration that prepared me to return to my job and make improvements faster.” Monica Kress, Chief, Office of Technology, State of California Department of Transportation, Division of Traffic Operations. “I would highly recommend the Academy to any who need to know how to initiate a TSM&O program. The training and the opportunity to meet many new colleagues is extremely valuable.” John Moore, District 5 TSM&O Representative, Florida Department of Transportation. “Operations Academy gave me the opportunity to learn “best practices” from the experts and peers who attended the academy with me. The Academy gave me tools and key points that I would use to take my passion for operations and mainstream operations into my organization.” L.K. Nandam, District Traffic Operations Engineer, Florida Department of Transportation. “I feel extremely fortunate to have been able to participate in the Operations Academy. This has been an incredible experience to network with truly dedicated professionals and take away very valuable information and lessons learned. 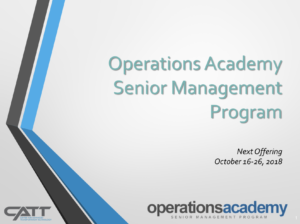 The Operations Academy is a once in a career opportunity to enrich your professional development while positioning you to influence the TSM&O direction of your own agency. 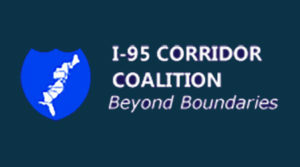 I highly recommend the program to transportation professionals; it is well worth the time commitment. Thank You! !” Anne Reshadi, Systems Operations/Electrical Engineering, Wisconsin Department of Transportation. “What I gain from this great program is what it takes to be an effective leader. Also this program gave me the tools to implement within the New Jersey Turnpike Operations Department. I would definitely recommend this program to others and also to let everyone know what a wonderful program you have developed.” Danny Ross, Shift Supervisor, New Jersey Turnpike Authority. “Great program – provided me with new skills that will enable me to positively affect their management and operations of the freeway and arterial systems in and around Nevada.” Paul Schneider, Assistant Division Administrator, Federal Highway Administration, Nevada Division. “Data & performance measures are a priority in CDOT. I gain valuable insight & information that I can take back.” Saeed Sobhi, ITS Branch Manager, Colorado Department of Transportation. “The Operations Academy was a very rewarding experience. I learned many operational strategies, best practices, and leadership techniques that I can take back with me and begin to implement within my own agency. I would recommend this program to any agency or person that plays a role in operations.” Eric Sponsler, ITS & Incident Management Supervisor, Pennsylvania Department of Transportation. “Networking with the different transportation disciplines provided me a more global perspective of transportation systems management & operations. The courses re-aligned my operational compass to focus more on “why” we do things (outcomes) rather than merely the day-to-day of how we do things.” Scott Yinger, Program Manager, Maryland State Highway Administration, Office of CHART & ITS Development.